The Rockwell Museum has a long history of collecting and exhibiting the art of Native peoples from across the Americas. The Museum’s original collectors, Bob and Hertha Rockwell, gathered historic examples from tribes of the Northern Plains and the Southwest Pueblos of America in an effort to contextualize the story of the American West. More recently, the Museum has purchased works by leading contemporary Native artists from a myriad of different tribal and ethnic backgrounds, in part to give voice to the contemporary Native American experience. Like the Rockwell collection, the sculpture of contemporary Inuit artist Abraham Ruben brings together ancient and contemporary worlds. Ruben uses the veil of time to examine Native identity in dramatic fashion. His hypnotic art contrasts two ancient peoples – the Norse and the Inuit – who helped shaped the complex history of the modern-day North American Arctic. Ruben combines high-level technical mastery of a several difficult media – bone, stone, ivory and bronze – with ethereal, almost hallucinatory, imagery. This contradictory combination of solid material and dream-like figures is at the core of what interests me about Ruben’s work. The physicality of Ruben’s work creates a solid connection to the contemporary world of the Inuit, while his imagery, drawn from Inuit and Norse mythology, connects his work to the mythic and spiritual world of the far North Country. The effect is electrifying, familiar yet dissonant. This is art at its finest. For bringing art at its finest to the Rockwell, my sincerest thanks go to Rocco Pannese of Kipling Gallery, Woodbridge, ON, Canada. Rocco conceived of this exhibition, tailored it to the Rockwell’s needs, and worked diligently with the artist and private collectors to bring together some of the finest examples possible of Ruben’s work. I would also like to thank the artist, Abraham Ruben, for creating such a compelling body of work, and for being receptive to its travel to upstate New York. Finally, I would like to extend my heartfelt gratitude to the Board of Trustees at the Rockwell, and especially Executive Director Kristin Swain, for supporting this exhibition. Without your support, exciting projects like this would not fill the Museum’s galleries. Kipling Gallery is proud to present the work of Abraham Anghik Ruben at the Rockwell Museum of Western and Native American Art. The scriptures presented in this exhibition was inspired by Abraham’s early cultural connection to the oral traditions and history of the north, his closeness to the land and his appreciation for natural arctic environment of his youth. These influences had a monumental impact in this work. The coming together of two cultures: the Viking and the Inuit, are inextricably intertwined in a new contemporary vision and artistic mastery. These masterworks in bronze and stone are certain to catapult this major artist to new levels. 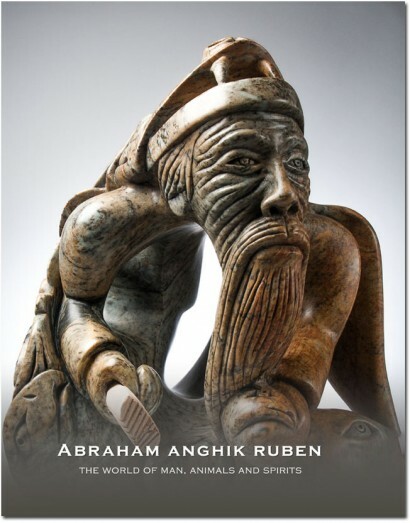 Abraham Anghik Ruben is leading the vanguard as one of the most relevant stone sculptors Canada has ever produced. I would like to thank the Rockwell Museum of Western and Native American Art and James Peck, for facilitating this exhibition venue, I would like to express my sincere gratitude to the lenders who have graciously shared their treasured acquisitions with us. Most of all, my heartfelt respect and indebtedness goes to Abraham Anghik Ruben for his strength of character, physical labour, and inspired creativity that went into sculpting these enduring contemporary masterpieces.